We remember a time when SDA market was known just for its impressive theka, and maybe a kebab roll or two. Now, the market has evolved into a food hub with 30+ eateries, and we're telling you our favourite ones. 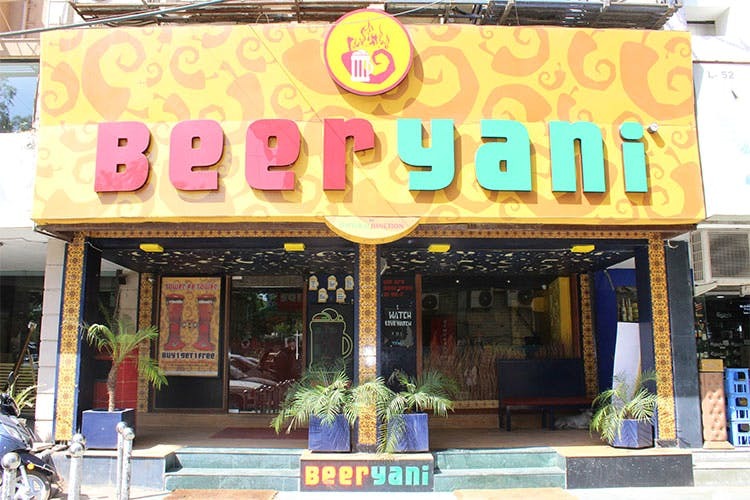 Recommended for: Cheap beer towers, delicious snacks and, of course, some awesome biryani. The perfect post-work meeting place, expect to see manyoffice-goerss and college students milling around waiting for a table. Recommended For: Quality service and comforting food which you won't mind paying a bit extra for. Here's a tip, sit on the ground floor, it's way better. Recommended For: Artisanal coffee, great breakfast and a relaxing ambience. It's no surprise that this place has become quite popular (and hence, crowded too at times). Recommended For: Pocket-friendly Chinjabi. This hole-in-the-wall place consists of your standard fare; momo, soups, noodle dishes, dry and wet mains, and bowl meals. This has also been our go-to for deliveries. Recommended For: They serve up a bunch of items, including a decent plate of biryani, kebabs and tikkas, mutton dishes as well as a few curries. However, nothing beats the Chicken Shawarma here. Known for these little drops of heaven, Spice Aangan attracts a loyal following of students, locals and foodies alike. Recommended For: Indulging your sweet tooth. This is where you come to for everything that's high on sugar but so delicious, you won't mind. Recommmended For: Great breakfast options & quiet ambience - perfect for solo dates. What To Order: Head to Burger Singh for desi burgers on a budget. The menu has a bunch of Indianised burgers which are large and quite filling. Recommended For: We prefer going to #nofilter to meet up with friends for a drink on the weekends, but they also serve up some decent food. The best part about the place is actually the terrce area (which sadly, has been closed for a while now), but we hear they'll reopen it by March end. Recommended For: Some delicious waffles- both sweet and savoury. Just go and give them a try, they don't disappoint. Psst...if you're a student, show them your ID card and they'll give you an ID card. Recommended For: Great service and a soothing space where chances of anyone disturbing you is next to none. Recommended For: Chai home deliveries. The popular tea outlet always seems to be bursting at the seams, and the staff at our office has been guilty of extensively indulging in this service, we’ve found their snacks to be quite enjoyable, too. Recommended For: It’s all in the name, isn’t it? Recommended For: Affordable drinks and live music. Although, their food is not as good as the surrounding eateries. Recommended for: You'd have to be living under a rock to not know this. This particular outlet has a tiny seating area on the first floor, too. What to Order: Italian B.M.T. Recommended For: tasty, thin crust pizzas with some pretty good sides to go with them. While definitely a pricey pizza option, their toppings are worth it. Recommended For: An ambience that's perfect to work, read a book, or for long, catch-up conversations. This is usually our go-to for grabbing coffee and a hearty breakfast (it opens pretty early). Their service is a tad slow, so be prepared to wait a bit for your order. Recommended For: the perfect ambience for a chill drinking scene with your posse (Their swinging chairs too, get them more brownie points).